I started my pages about hallmarking to document information about imported watches, which is not readily available in the standard references such as Bradbury and Chaffers. However, I realised that many people with a watch that they have perhaps been given or inherited don't have ready access to these standard works, so on this page I show some examples of the British hallmarks that were found in any watch cases that were hallmarked before 1 June 1907, and which continued to be used in British manufactured watch cases after 1907. I can't (for copyright reasons apart from anything else) reproduce the information in Bradbury or Chaffers, but I hope the examples here will help you read the hallmarks in your own watch. If you want some help, don't hesitate to email me, but do try to send me a clear picture or sketch of the mark you need help with. Please bear in mind that in this context "silver" means the element silver, number 48 on the periodic table. It does not mean "silver coloured" or silver plated. In Britain it is illegal to describe something as silver unless it is mainly composed of silver. Small amounts of alloy are allowed for practical reasons, but an item described as sterling silver must be at least 92.5% pure silver. Similar considerations apply to the word "gold". The principal use of a hallmark on silver or gold is to show the fineness of the metal; sterling or Britannia for silver, the carat fineness for gold, e.g. 18 carat. British hallmarks also indicate to within 12 months of when the item was hallmarked, and this is of great interest to collectors. 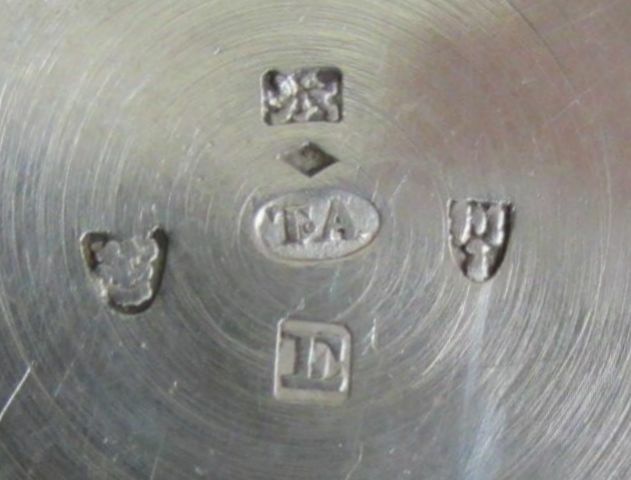 The 12 month period in which the item was hallmarked is indicated by a "date letter" which were used in "cycles", A for a certain period, B for the next and so on. British assay offices all used different cycles of date letters, so to read a British hallmark date letter you must first identify at which assay office the item was hallmarked by identifying the assay office town mark. Then you must use a table of date letters appropriate for that office. At first sight British hallmarking seems very easy to understand, but there are many traps for the unwary. For instance, London Assay Office cycles of date letters started in 1478, using 20 letter a to u excluding j which didn't exist at the time. The Birmingham Assay Office cycles of 25 or 26 date letters started when the Birmingham office was founded in 1773, nearly 300 years later. So it is no wonder that their date letter cycles are different. And then you must bear in mind that most published tables only show date letters for silver; date letters punched on gold were different. London, sterling, 1860/61, Richard Oliver. Click image to enlarge. 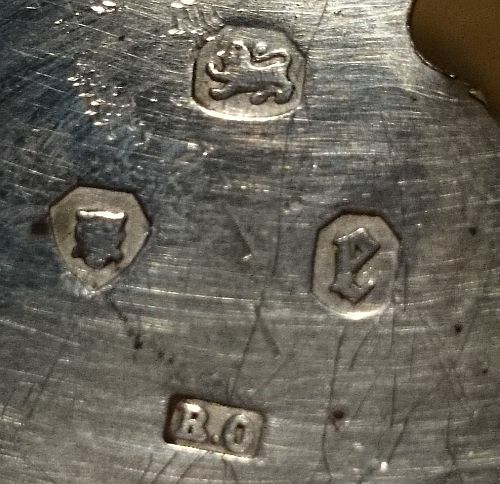 There are lots of examples of British hallmarks on silver on my British hallmarks examples page, but let's make a start with the hallmarks in the picture here, just to get a feel for what a set of British hallmarks looks like. The first thing to note is that there are four distinct marks. A valid and legal British hallmark on silver or gold must always have at least these four marks. Sometimes there are additional marks to do with duty or a monarch's jubilee, but the four marks described here are the essential ones. Starting at the top the first mark is a walking lion with raised right forepaw. This is the British "lion passant" which indicates that the silver is of sterling fineness. Below this is a leopard's head, which in this case is the "town mark" of the London Assay Office. To the right is the London "date letter" e, which shows that the item was assayed and hallmarked in 1860 or 1861. At the bottom is the "sponsor's mark" R.O in rectangular shield, the mark of Richard Oliver, first registered 16 February 1859. These marks are each explained in greater detail below, but please be aware of two important points. First, that British assay offices all used different cycles of date letters, so to read a British hallmark date letter you must first identify at which assay office the item was hallmarked and then use a table of date letters appropriate for that office. Second, that the sponsor's mark shows under whose name an item was submitted for hallmarking, its purpose is not show who made an item. From 1975 the legal requirement for the fineness mark changed from the lion passant on sterling silver to a millesimal mark, i.e. 925, which is sterling silver expressed in millesimal form. It is still possible to ask the assay office to strike the traditional lion passant mark but this is no longer a legal requirement. The assay office charge extra for striking this additional mark so it is not always done, but I like to see the lion, the most recognised of marks for over 470 years, so I have the full set of traditional marks struck on my work. The lion passant was introduced in 1544 in the reign of Henry VIII and I like to think that if King Henry walked into my workshop today he would recognise the all hallmarks on my work apart from the 925. London hallmarks 1883/84 on 18 carat gold. Note the shape of the date letter shield. Click image to enlarge. Because of the enormous cost of gold, most of the hallmarks that collectors find are on silver items. Very few private individuals have gold dishes or gold candlesticks in their homes, and for this reason the standard reference books, Bradbury, Chaffers' etc. concentrate on hallmarks on silver. Watches are unusual in this regard, because gold watches are quite often purchased or inherited, and are often the only items of gold other than jewellery that a collector will ever see and own. As jewellery, apart from wedding rings, is almost never hallmarked, the hallmarks on gold, particularly the shape of the shield around date letter, are unfamiliar territory to most collectors who know about hallmarks. The tables of date letters found in most reference books show only the date letters and their shields that were impressed on silver items, although they don't tell you this. The same date letter was used on gold items, but the enclosing shield shape was different from that used on silver. The picture here shows a set of hallmarks in an 18 carat gold watch case. 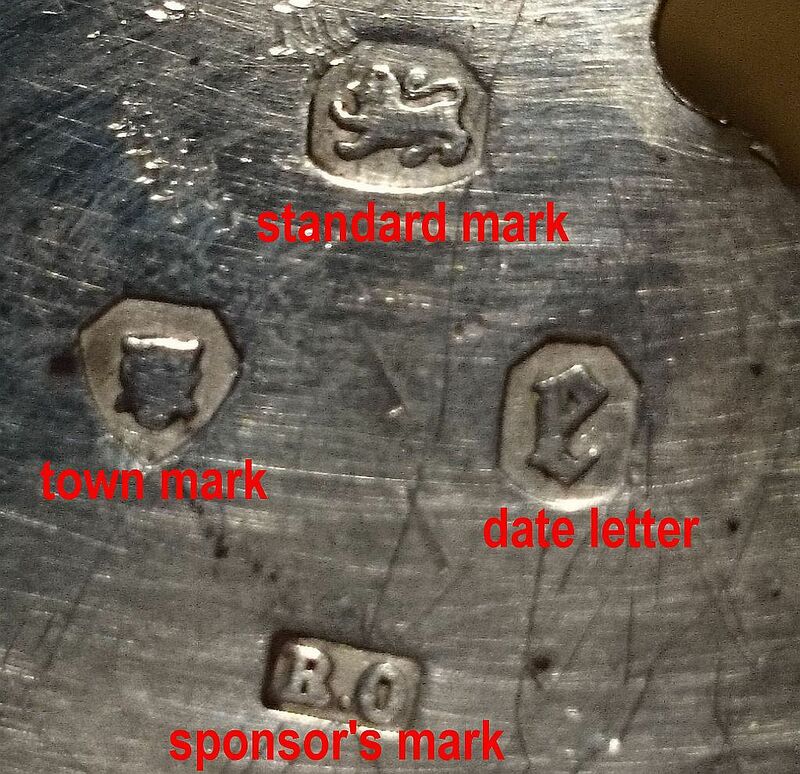 Again we have the same set of four distinct marks, the sponsor's mark AF at the top, the date letter to the left, the leopard's head of the London Assay Office to the right and the standard mark in the centre. In this case the standard mark is in two parts, a crown and the figure 18 signifying 18 carat gold. When the 18 carat standard was introduced in 1798 it was marked with a crown and the number 18. The lion passant was the fineness mark used on 22 carat gold from 1544 until 1844. After 1844 both standards were marked with a crown and either the number 22 or 18. When the lower standards of 15, 12 and 9 carats were introduced in 1854 their fineness marks were the carat and its decimal equivalent, i.e. 15/.625, 12/.5 and 9/.375. When the 15 and 12 carat standards were replaced in 1932 by the 14 carat standard, that fineness was marked with 14/.585. From 1975 the legal requirement for the fineness mark changed from carats, e.g. 18, to millesimal, e.g. 750, which is 18 carats expressed in millesimal form; 18 / 24 = 0.750. It is still possible to ask the assay office to strike the traditional crown mark on gold, but this is no longer a legal requirement. The assay office charge extra for striking this additional mark so it is not always done, but I like to see it so I have a full set of traditional marks struck on my work, and they will strike the crown on 9 carat gold, which surprised me. Note that the date letter "H" for 1883 to 1884 is surrounded by a rectangular shield with cut corners. This is different to the shield around the date letter used on silver items. 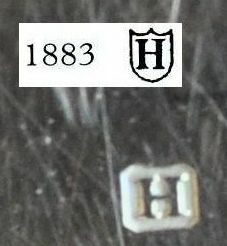 I have added a picture of the the same date letter "H" from the table of date letters on silver in Bradbury's Book of Hallmarks to show the difference. The shield shape for the date letter used on silver is "shield" shaped , i.e. with a pointed base, curved sides and double concave top. The date letter in the 18 carat gold watch case is rectangular, which is the correct shape for a London Assay Office date stamp on 18 and 22 carat gold for letter cycle XXI . The shields used by the London Assay Office around 15, 12 and 9 carat gold date letters during this cycle were round. Standard mark - the tested and guaranteed minimum fineness of the metal. Date letter - a mark which shows when the item was marked. Sponsor's mark - a mark showing under whose name an item was submitted for hallmarking. If the watch case was hallmarked between 1784 and 1798 there should also be a fifth mark, a duty mark of the sovereign's head. Watches were made exempt from this duty in 1798 to enable English watch manufacturers to better compete with foreign made products, so the duty mark shown between 1784 and 1890 in tables of hallmarks in Bradbury and other standard references is not found on watch cases. The duty on all other gold and silver plate was abolished in 1890, and consequently the sovereign's head ceased to be impressed on assayed articles. You might find a letter "F" in an oval shield like the one shown here signifying Foreign manufacture if the watch case was imported and hallmarked between 1867 and 1887. I have never seen one of these marks in a watch case so if you do find one, please let me know - don't get it mixed up with an "F" date letter which will have a different shaped shield around it, remember that this F mark will be in addition to the date letter. After 1 January 1888 imported watch cases were no longer allowed to be marked with the usual form of British hallmarks, so this mark was no longer applicable either. Each assay office has its own unique office or town mark to show where the item was assayed. The exception to this is the London Assay Office. It is often said that the leopard's head is the town mark of the London office, but this is not strictly true, only if struck with no other town mark does the leopard's head show that the item was hallmarked in London. Chester - upright sword between three wheatsheaves (garbs). Sheffield - a crown for sterling silver, and from 1903 a rose for gold. Edinburgh - a three towered castle. Glasgow - a tree with a bird, a bell, and a fish with a ring in its mouth. Dublin - a figure of Hibernia seated. Note: In describing the leopard's head as the town mark of the London Assay Office I am following the practice of standard works such as Bradbury and Chaffers, but in reality the leopard's head was and remained the standard mark - the London Assay Office didn't have its own unique town mark. The leopard's head was struck along with the lion passant by the old offices of Chester, Exeter, Newcastle and York from 1720 for some time after the sterling standard was reintroduced. It was only the new offices of Sheffield and Birmingham that used the lion passant alone as the standard mark. So strictly I should say that when the leopard's head is found on its own without a separate additional town mark it can be inferred that the item was hallmarked in London. The early form of the leopard's head looks suspiciously like a lion, because the medieval heralds term for a lion shown passant guardant, i.e. looking towards the viewer, was "leopart", which was used in the Act of 1300 by Edward I, which became rendered into English as "leopard". The depiction of this creature gradually changed over the centuries so that it eventually looked like a leopard. From 1478 until 1821 the leopard was pictured wearing a crown, since then he has been without the crown or mane. The reason the crown was omitted is not known. The emblem of Glasgow can be traced back to the legend of Saint Mungo, the founder and patron saint of the city of Glasgow. After 1 June 1907 very different town marks were used for imported watches, which you can read about on my page about Import Hallmarks. The leopard's head was a standard mark, not a town mark, and it wasn't superseded by the lion passant when that came into use in 1544. The leopard's head and the lion passant were both stamped on gold and silver by the London Assay Office at Goldsmiths' Hall. When the provincial assay offices were set up, each had a unique town mark to identify it, usually the arms of the town. This was stamped along with the leopard's head standard mark. The London Assay Office was the only office that didn't have its own unique town mark, but a leopard's head with no other town mark shows that the hallmarks were struck at the London Assay Office. After 1720 the lion passant and leopard's head were both marked by provincial assay offices as standard marks until the leopard's head fell out of use for reasons unknown. Image courtesy of and © Jacqueline C.
Until 1697 London was the only office that marked the leopard's head and lion passant on silver. However, when the Britannia standard was introduced the assay offices of Chester, Exeter, Newcastle upon Tyne and York were authorised to strike the marks of the lions head erased and the figure of Britannia on silverwares of the new standard. When the old standard was reintroduced in 1720, these offices were also authorised and required to strike the leopard's head and lion passant on sterling silver. 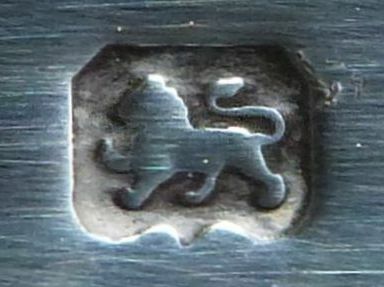 The mark of a leopard's head and lion passant without an additional town mark shows that the item must have been hallmarked in London at Goldsmiths' Hall, but the leopard's head and lion passant marks can also be found on silver marked at provincial English assay offices, when they are accompanied by a town mark. The image here of a Chester hallmark for sterling silver. At the top is the lion passant, to the left is a leopard's head. The leopard's head was struck along with the lion passant by the Chester assay office with a crown from 1720 until 1822, and then without a crown from 1822 until 1839. The sponsor's mark "T•A" in cameo with an elliptical shield was entered at Chester by Thomas Adamson of Liverpool. In the nineteenth century a Chester hallmark in an English watch case like this usually identifies the watch as having been made in Liverpool. Liverpool didn't have its own assay office so watch cases were sent from Liverpool to Chester, a distance of only about 20 miles, to be assayed and hallmarked. The Exeter assay office struck the leopard's head with a crown until 1778, York struck the leopard's head with a crown until the 1850s and Newcastle struck the leopard's head with a crown until its office closed in 1884. The reason why the provincial offices stopped striking the leopard's head standard mark alongside the lion passant is not known. Since 1720 all English assay offices struck the lion passant on sterling silver. 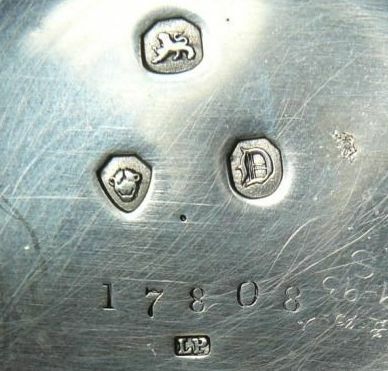 The Birmingham and Sheffield Assay Offices, authorised in 1773, never struck the leopard's head mark, their authorisation only specified the lion passant. The year denoted by the date letter can be confusing because until 1975, when the 1973 Act came into force, the hallmarking year did not run from 1 January. This mark was introduced in 1478 and was at first called the "assayer's mark", because it was intended to be a record of who was responsible for the assay of an item if questions later arose. For this reason it was changed each year when the new wardens were elected and thereby indicates the date when the item was assayed and hallmarked, although this was not its original purpose. Prior to the Restoration of King Charles II in 1660, the London hallmarking year commenced on 19 May, the Feast Day of Saint Dunstan, Dunstan was born at Glastonbury in about the year 925 and is the first recorded working goldsmith in England. He built a cell near the Abbey of Glastonbury containing a forge where he made censers and crosses, chalices and patens, as well as articles for domestic use. He successively became Abbot of Glastonbury, Bishop of Worcester, Bishop of London and Archbishop of Canterbury. After his death on 19 May 988 he was buried in Canterbury Cathedral, canonised in 1029, and became the patron saint of all good goldsmiths. The London Goldsmiths' Company especially honoured St. Dunstan, subscribing towards the light of St. Dunstan in the Church of St. John Zachary, keeping his day as a holiday, and designating him in their records as "Seynt Dunstan our blessed Patron, Protector and Founder". patron saint of English gold and silversmiths. From the restoration of Charles II to the Monarchy in May 1660 until 1973, the London hallmarking year officially commenced on Oak-apple Day (the King's birthday), 29th May, but the actual date when the new letter was first struck was sometimes later by days, and even weeks, depending on when the new punches were accepted by the Wardens, the letter "s" causing trouble on several occasions because the there is no distinct lower case version of the letter s.
The letter j was invented in the 16th century as a variant of the letter i to allow finer nuance in the written word. This bit of obscure information can be useful if you come across a word like "fjord" (a partially submerged Norwegian coastal valley). At first sight most English speakers would stumble on this word, but just imagine the j as an i and you are close to the correct pronunciation of "fee-yord" - it's not exactly the same because the j sound is slightly different to the i sound, but it gets you close. And you can do vice-versa with i for j if you need to. The point of all this is that the date letter change is nearly half way through the calendar year! So an item marked by the London Assay Office with an "a" which the table in Bradbury indicates is the date letter for 1916 could have been marked at any time from 29 May 1916 to 28 May 1917, or possibly even some time in June. 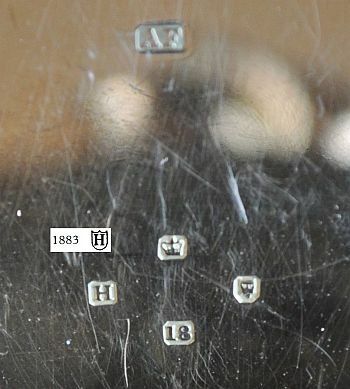 The date letters used by the London Assay Office to indicate the hallmarking year ran in sequences of 20, starting at the letter "a" and running up to "u", omitting the letter "j". Other offices used the full cycle from "a" to "z". To send an item to the Assay Office to be assayed, a person must register his details with the particular Assay Office. The reason for this is pretty obvious - the Office needs to know who to charge for their services and who to return the items to, and who to prosecute if a criminal offence has been committed. 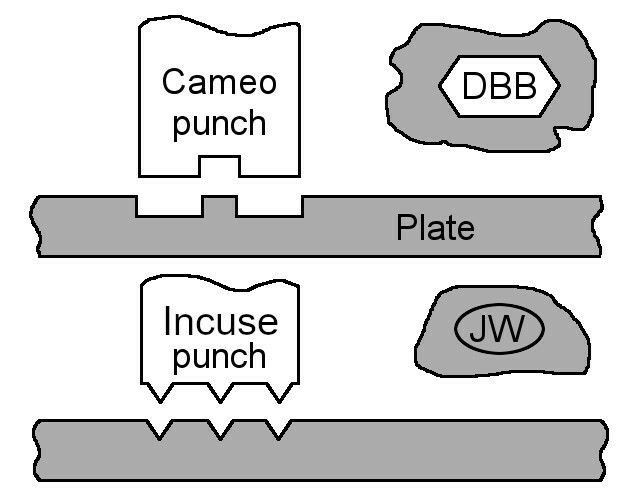 To facilitate this, the Assay Office requires that each registered person have a registered punch mark, called the "Sponsor's mark", which is unique to them. This usually consists of the persons initials set in a "shield", a surrounding shape. If a person has the same initials as someone already registered, the shield of their mark will be made different so that the two marks can be distinguished. Every punch that can be used to impress the mark must be registered. This mark is sometimes called the "maker's mark" by people who don't really understand its purpose and use. The sponsor's mark is the registered mark of the person who submits an item for hallmarking, who is not necessarily the person who actually made the item. This was first officially recognised in law in the 1738 "Plate Offences Act" but had obviously been practice for some time before then. The photograph of the London hallmarks shown here has a date letter which is a "Black Letter" capital "D". This is the date letter for the year 1839/40. But the shape of the leopards's head mark is from an earlier cycle of date letters that ended in 1836; the tables in Bradbury's and Jackson's show a much more "leopard like" head for the date letter cycle that began in 1836. Looking at the leopard's head stamped here you could easily be misled into thinking that the date must be 1836 or earlier. The explanation for this is that all punches that incorporated a date letter were defaced at the end of a date letter cycle. However, individual punches, such as the leopard's head or the lion passant that were not "date sensitive" could continue to be used until they were worn out or considered unusable. So the leopard's head mark shown in the picture here continued to be used after 1836, despite what the tables in the reference books show. The sponsor's mark LP in a rectangular shield was entered by Lewis Phillips, a London watch case maker first registered at the London Assay Office 27 November 1838, this mark registered 13 May 1839. There is nothing like looking at a few examples to give you an idea of what to look out for when you are trying to read a set of hallmarks. There are lots of examples on my British hallmarks examples page.